Pay TV operators lost 900K subscribers in Q3 2018. It looks like pay TV’s loss is Roku gain. The company added another 1.8 active users, with ARPU and minutes streaming increasing too. Roku added 1.8 million active users in Q3 2018, to reach 23.8 million. 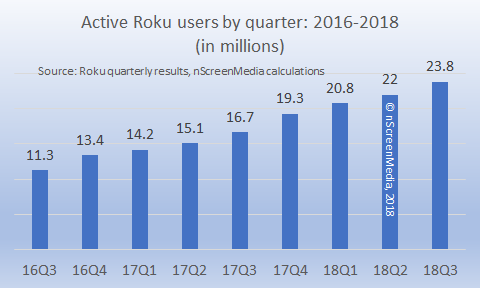 The performance is even more remarkable when you consider Roku has added 7 million active users in the last year, and more than doubled the number in the last two years. Not only are more people using a Roku powered device but also, they are streaming more content. The average active user streamed 2 hours and 50 minutes per day in Q3, an increase of 14.5% over the same quarter last year. Pay TV is contracting almost as fast as Roku is growing. Cable, satellite, and telco TV providers lost 900,000 subscribers in Q3 2018. Satellite providers have lost almost 4 million subscribers in just the last year. In some respects, Roku replaces the need for a pay TV operator. Users can access a wide variety of channels through the device and Roku makes it easy to find and play the content on television. Unlike pay TV, however, everything is purchased a la carte and Roku makes plenty of quality content available without any subscription via ad-supported services like the Roku Channel. Many consumers say they want the features offered by Roku. 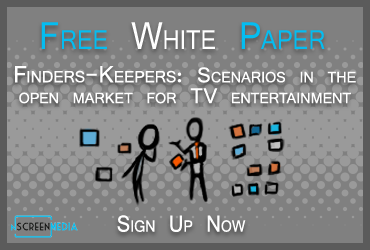 For example, three-quarters say they want to build their own pay TV channel bundles, as they can with Roku. As well, Roku surveyed a group of new Roku users and found that 43% said the availability of free content was a big part of the reason they chose a Roku over competitor products. Revenue increased 39% over the same quarter last year, reaching $173 million. Player revenue increased 9% year-over-year (YoY), to $73 million. Platform revenue grew 39%, to reach the $100 million mark for the first time. Average quarterly revenue per active user (ARPU) also showed impressive gains. It now stands at $17.34, up 37% YoY. [i] Roku has almost doubled ARPU over the last two years. Much of those gains have come from advertising, and The Roku Channel is driving most of the ad views. 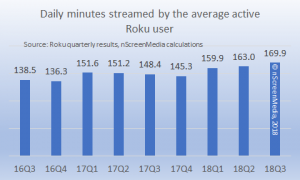 Scott Rosenberg, SVP and GM of Roku’s Platform business, says The Roku Channel entered the top 5 channels on the platform (as measured by active account reach) faster than any other channel in the company’s history. Roku has been investing heavily in data gathering, ad technology, and ad intelligence. The company launched the Measurement Partner Program (MPP) in Q2 of 2018. The objective was to help brands and publishers quantify the performance of campaigns run on Roku platforms. A group of 11 partners, including Nielsen and comScore, participate in the program helping Roku to measure and quantify ad performance in multiple dimensions. The MPP has allowed Roku to prove to advertisers how well their campaigns performed. For example, the company says a recent cruise line campaign got a 46% increase in website visits among 25-34-year-olds. Roku continues to grow its business in all dimensions. The company has invested in the tools it needs to convince reluctant TV advertisers that Roku is a better option to reach their target audience. Roku seems well positioned to continue to grow strongly. 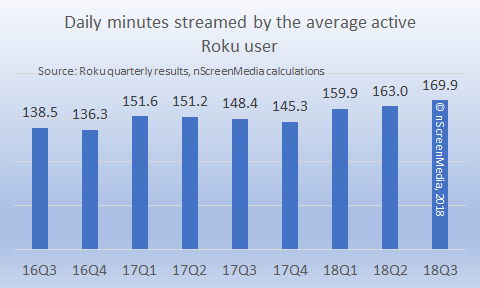 [i] Roku defines ARPU as platform revenue during the preceding four quarters divided by the average of the number of active accounts at the end of that period and the end of the prior four quarters.